High technology tubefly vise designed to work a wide range of tube sizes. The shaft is in-line full rotary thanks to dual precision ball bearings. The ergonomic shape and the double diameter handwheel adds to its functionality. 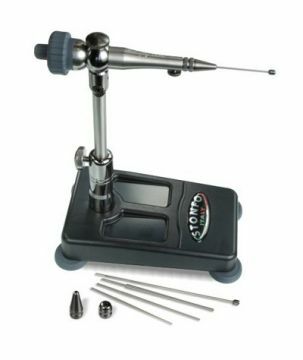 The tubefly vise includes 3 accurately machined graduated pins and 2 cylindrical pins for tying on all different tubes. Supplied with pedestal base, spring material clip, allen key and instruction manual.